Arlington marathoner Michael Wardian has a couple of new medals for his extensive collection. Wardian, 36, placed third in the 50K World Championship race in Galway, Ireland, earning a bronze medal on behalf of the USA. Just a week later, on Sunday, Sept. 4, Wardian won the Kaua’i Marathon in Hawaii. His time of 2:30:52 just barely missed the 2:30 mark, which would have earned him a $15,000 bonus prize. Another Arlington runner, Michael Zinn, placed 17th in the race. 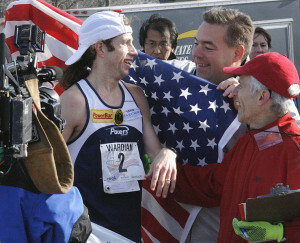 Finally, on Sunday, Wardian placed third in the Parks Half-Marathon in Montgomery County.